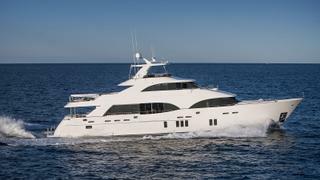 A new-build 34.12 metre Ocean Alexander motor yacht has been sold with Bruce Siler at Marinemax acting for both buyer and seller. Currently under construction at the Taiwanese yard in GRP to an in-house design, delivery of this OA112 model is scheduled for 2018. The accommodation is laid out for 10 guests in five cabins comprising a master suite, two VIP suites and two twins, all with LCD television screens, entertainment centres and en suite bathroom facilities. An additional three cabins will sleep five crew. The main saloon is luxurious and comfortable, with an L-shaped sofa and occasional chairs, a granite-topped wet bar and an entertainment centre including a 60 inch LCD television screen. The galley is fully equipped with professional systems for gourmet cooking and also has a dinette with an L-shaped table and a 26 inch LCD television. Up in the sky lounge is further comfortable seating, large windows and another entertainment centre including a 60 inch LCD television screen. Al fresco entertaining and dining is available on an expansive aft deck with upholstered bench seating, a bar, fridge, ice maker and a 22 inch LCD television. Another favoured spot for guests is the sky lounge which has three helm chairs, a raised settee, a wet bar, fridge, ice maker and a 22 inch LCD television screen. Twin 2,600hp MTU diesel engines will give her a cruising speed of 17 knots, topping out at 24 knots. The asking price of the Ocean Alexander 112 has not been disclosed.